Upstream of the waterfall a pool was formed by the scouring action of rocks and it was this pool that eventually broke through into a cave below forming an archway or bridge. 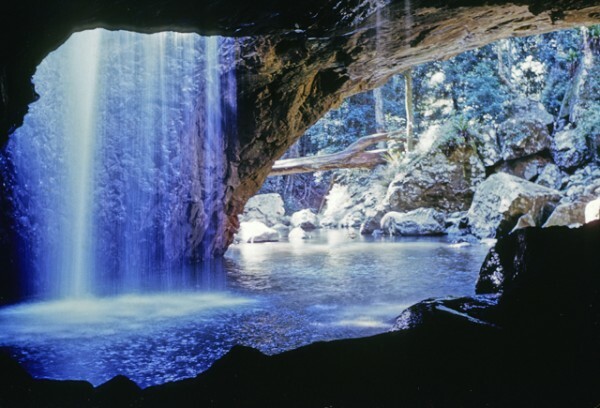 The Natural Bridge, also known as Natural Arch, formed at the edge of a waterfall in the Numinbah Valley where, over many years, the surrounding rock was eroded by the falling water. Upstream of the waterfall a pool was formed by the scouring action of rocks and it was this pool that eventually broke through into a cave below forming an archway or bridge. Further movement of water and rocks have resulted in the natural feature that countless people have visited. While tourists have long admired the beauty of the valley and surrounding areas, another unique feature is the small bright blue-green lights adorning the underside of the arch in the evening. The thousands of glow worms, in reality the larval stage of a tiny fly Arachnocampa flava, are responsible for the formation also being known as the glow worm cave. 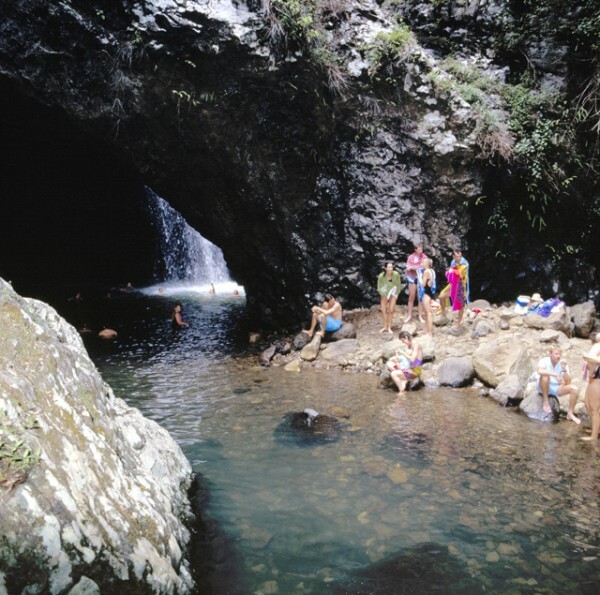 Though Natural Bridge would have been long known to the Yugambeh people, there are a number of stories about the first European settlers who first saw the formation. One version centres around two timber getters, Alexander Duncan and Denis (Din) Guinea who, accompanied by Kipper Tommy of the Yugambah people, were harvesting timber in the rain forest above Cave Creek. Alexander came across the waterfall and bridge when he went down to the creek to get water and returned to tell Din Guinea. The precise date when the three men were in the area is difficult to determine with suggested dates ranging between the 1870s and 1893 but it’s believed that 1891 or 1893 is the most likely time frame. 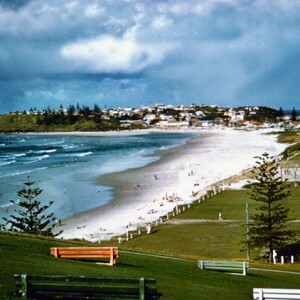 In 1922 the area was managed as a reserve by the Queensland Forestry Department with the beauty of the area as a destination for day trippers promoted in newspapers during the 1930s. Improved road access between the region and New South Wales took place in the late 1940s with the Natural Arch featuring in Charles Chauvel’s movie ‘Sons of Matthew’ filmed in the Numinbah Valley in 1947. 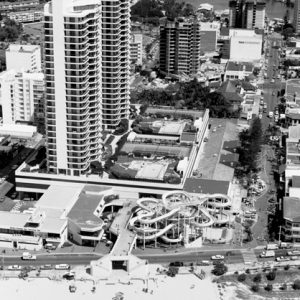 In 1959 the rock formation and a surrounding area became a National Park and, in 1979, the natural formation gave its name to the surrounding area when it was adopted by the Queensland Place Names Board. Three years later the park, formerly known as Natural Bridge, would be renamed to Natural Arch National Park. 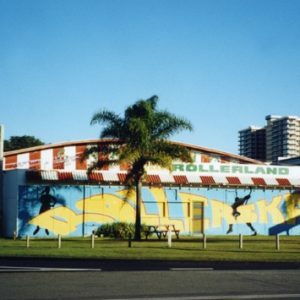 Queensland State Government, Department of National Parks, Sport and Racing. www.nprsr.qld.gov.au/parks/springbrook/culture.html#glowworms Accessed 7/12/2015. Hall, Pamela. Numinbah Valley: a social and natural history 1840s – 1988. 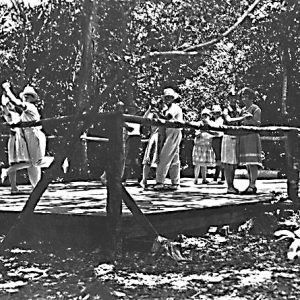 Numinbah Valley: Numinbah Valley Bicentennial committee, 1988. “Short Motor Trips For Holidaymakers.” The Telegraph (Brisbane, Qld. : 1872 – 1947) 16 Dec 1940: 14 Edition: CITY FINAL LAST MINUTE NEWS. Web. 4 Jan 2016.